SFI Readerlink Dist, 9780794441951, 10pp. 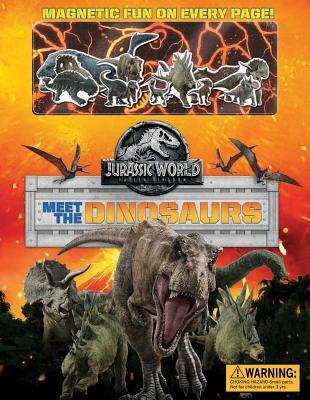 Relive Jurassic World: Fallen Kingdom and then create your own scenes with over 10 magnetic dinosaurs in this amazing storybook! Meet the dinosaurs of Jurassic World—from the ferocious Tyrannosaurus Rex and the meek baby Triceratops to the deep-diving Mosasaurus and the soaring Pteranodon. Discover fun facts about the amazing dinosaurs that roam Isla Nublar and the ruins of the fallen kingdom of Jurassic World! Gina Gold has written and developed projects for Sesame Street, Scholastic, Warner Brothers, Reader’s Digest, and SeaWorld among other publishers and media outlets. She is known for bringing fresh ideas and creativity to stories featuring some of the world’s most recognizable characters. Gina is also a television writer and an award-winning journalist. She lives in Los Angeles, CA.